Elise was born December 1, 2004 in Santa Maria, California. She was an absolutely perfect baby with an easy pregnancy. We never imagined we could love someone as much as we love Elise. The next 6 months were the happiest months of our lives. Elise was a very happy and content baby, but around 7 months Elise still hadn't learned how to sit up. We were concerned, yet everyone said not to worry about it - babies learn at their own rate. 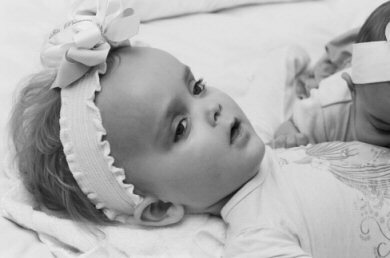 Elise had a well baby check up at 9 months when the doctors became concerned as well. 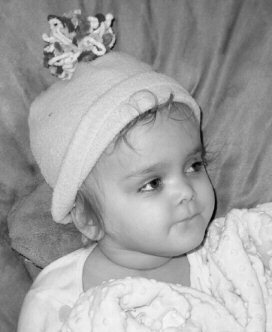 It wasn't long after that on November 3, 2005 that we received the news that our baby girl was diagnosed with Tay-Sachs. We were told our baby would have 2-4 years to live. ......this news is hard to bear. After the best year of our lives, this news is hard to bear. We moved to Scott AFB, IL in January of 2006 to be near family and a good children's hospice program. Since our move, we have welcomed in Eden Elise Rochman to our family (11/28/06). She is a handful, but she loves to help us take care of Elise and give her endless amounts of love. For more information and updates, please visit www.caringbridge.org/visit/babyelise.